Definition at line 257 of file stream-tcp-private.h. Definition at line 269 of file stream-tcp-private.h. Referenced by AppLayerIncTxCounter(), DetectEngineInspectStream(), DetectStreamSizeFree(), DetectStreamSizeRegister(), FlowChangeProto(), FlowGetDisruptionFlags(), RegisterSSLParsers(), SigMatchSignaturesGetSgh(), StreamNeedsReassembly(), StreamReassembleRaw(), StreamReassembleRawHasDataReady(), StreamReassembleRawUpdateProgress(), StreamTcpDetectLogFlush(), StreamTcpDisableAppLayer(), StreamTcpFreeConfig(), StreamTcpPacket(), StreamTcpPruneSession(), StreamTcpPseudoPacketCreateStreamEndPacket(), StreamTcpReassembleDepthReached(), StreamTcpReassembleHandleSegment(), StreamTcpReassembleInsertSegment(), StreamTcpReassembleTriggerRawReassembly(), StreamTcpReassemblySetMinInspectDepth(), StreamTcpSegmentForEach(), StreamTcpSessionCleanup(), StreamTcpSessionPktFree(), StreamTcpSetDisableRawReassemblyFlag(), StreamTcpSetSessionNoReassemblyFlag(), StreamTcpThreadDeinit(), StreamTcpUTClearSession(), StreamTcpUTSetupSession(), TmModuleFlowRecyclerRegister(), UTHAddSessionToFlow(), and UTHAddStreamToFlow(). Definition at line 262 of file stream-tcp-private.h. Referenced by AppLayerIncTxCounter(), FlowChangeProto(), and StreamTcpReassembleHandleSegmentHandleData(). Definition at line 266 of file stream-tcp-private.h. Referenced by AppLayerHandleTCPData(), AppLayerIncTxCounter(), AppLayerParserRestoreParserTable(), SMTPParserCleanup(), StreamNeedsReassembly(), StreamReassembleRawUpdateProgress(), StreamTcpAppLayerIsDisabled(), StreamTcpPacket(), StreamTcpPruneSession(), StreamTcpReassembleAppLayer(), StreamTcpReassembleHandleSegmentHandleData(), StreamTcpReassembleInsertSegment(), StreamTcpSetSessionBypassFlag(), StreamTcpSetSessionNoReassemblyFlag(), and StreamTcpThreadDeinit(). Definition at line 260 of file stream-tcp-private.h. Definition at line 270 of file stream-tcp-private.h. Definition at line 261 of file stream-tcp-private.h. Definition at line 267 of file stream-tcp-private.h. Referenced by StreamTcpFreeConfig(), StreamTcpReassembleDepthReached(), and TcpSessionSetReassemblyDepth(). Definition at line 258 of file stream-tcp-private.h. Definition at line 268 of file stream-tcp-private.h. Referenced by AppLayerIncTxCounter(), DetectEngineInspectStream(), DetectStreamSizeRegister(), FlowChangeProto(), FlowGetDisruptionFlags(), RegisterSSLParsers(), SigMatchSignaturesGetSgh(), StreamNeedsReassembly(), StreamReassembleRaw(), StreamReassembleRawHasDataReady(), StreamReassembleRawUpdateProgress(), StreamTcpDetectLogFlush(), StreamTcpDisableAppLayer(), StreamTcpFreeConfig(), StreamTcpPacket(), StreamTcpPruneSession(), StreamTcpPseudoPacketCreateStreamEndPacket(), StreamTcpReassembleDepthReached(), StreamTcpReassembleHandleSegment(), StreamTcpReassembleTriggerRawReassembly(), StreamTcpReassemblySetMinInspectDepth(), StreamTcpSegmentForEach(), StreamTcpSessionCleanup(), StreamTcpSessionPktFree(), StreamTcpSetDisableRawReassemblyFlag(), StreamTcpSetSessionNoReassemblyFlag(), StreamTcpThreadDeinit(), StreamTcpUTClearSession(), StreamTcpUTSetupSession(), TmModuleFlowRecyclerRegister(), UTHAddSessionToFlow(), and UTHAddStreamToFlow(). Definition at line 259 of file stream-tcp-private.h. 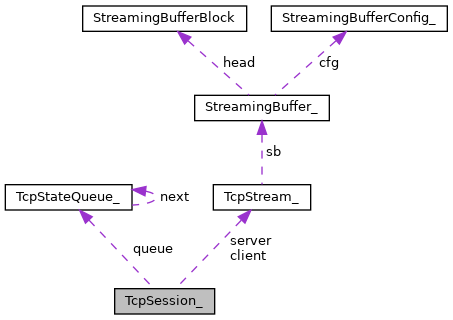 Referenced by FlowForceReassemblyNeedReassembly(), StreamNeedsReassembly(), StreamTcpFreeConfig(), StreamTcpPacket(), StreamTcpReassembleAppLayer(), StreamTcpReassembleHandleSegment(), StreamTcpReassembleHandleSegmentHandleData(), StreamTcpThreadDeinit(), and TmModuleFlowRecyclerRegister(). Definition at line 264 of file stream-tcp-private.h. Referenced by StreamTcpFreeConfig(), and StreamTcpPacket().